My Rotten Dogs: My "Shelter Special"
As I've recounted many times, Faolan was adopted over four years ago from a local shelter. Everywhere he goes, people are drawn to him, because of his personality and appearance. He is quite a unique looking dog. Not quite German Shepherd-ish, not quite Husky-ish. The two most common questions I hear from folks about him are "What is he?" and "Where did you get him?" I answer both questions with one answer, which most people love. "He is a Shelter Special." I love giving people this answer. Although I did a Wisdom Panel on him, the results were fairly inconclusive, indicating some German Shepherd and some Malamute. So I honestly don't know what he is. I do know he is unique, beautiful, and from a shelter. While I am not at all opposed to responsible breeding, I am a huge advocate of adoption. 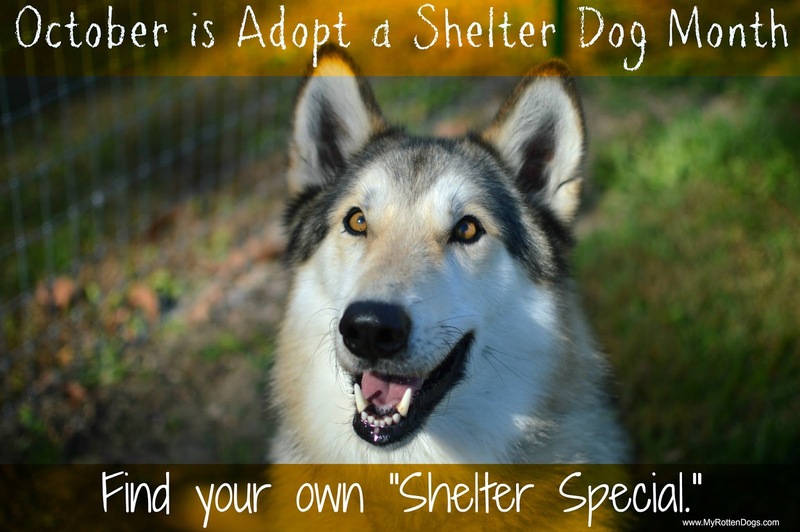 There are countless sweet, unique, and beautiful dogs to be found in shelters and rescue. You don't know until you go. Puppies, young dogs, middle aged dogs, and old dogs are available at shelters. Purebred and Heinz 57 mutts. Tiny, massive, and all sizes in between. By adopting a shelter dog, you can see the laughter and joy on strangers' faces when you tell them your dog is a "shelter special." Whatever he is, he is one handsome dude!! !